If you have not looked at your walls in recent times, doing so may leave you surprised at what you will discover. Looking at your wall very closely will reveal some more dust and dirt than just those obvious sticky hand-prints and crayon drawings. Cleaning painted walls are very simple, but you must be careful not to allow the stain spread or remove the paintwork. Knowing your paint type is also important. More modern paint like gloss, is normally hard to wash. Alternatively, much older paints like the whitewash styles, can be scrubbed off and greater care must be taken during the cleaning process. Let us delve into the most modern ideas on how to clean painted walls. Start by aligning the floor with plastic on the area you will work to avoid damages due to excess spills or water. Remove loose dirt and cobweb using your vacuum's brush attachment. Avoid pushing the brush onto the surface of the wall, if you do, loose dirt will smudge and leave some marks. Permit the vacuum's suction to remove the dirt from the wall. Begin from the uppermost part of the wall. You will want to clean from one side to the other and from the top to the bottom side section by section as work round the room. Fill the bucket of water 1/2-2/3. Add an adequate amount of detergent to form a few bubbles when the water is disturbed. Adding much soap will make the walls sticky and bring more dirt. Dip your sponge in the water in the bucket and remove excess water by squeezing. Wipe the wall from top to down just like it was explained in the third step, but stop and rinse your sponge occasionally. Dry up excess moisture while you work by using the towel. Remove excess crayon from your wall using a dull knife. The next thing will be to simply rub the affected wall using Mr. Clean Magic Eraser. The crayon lifts right up. Use some mild detergent mixed with water, keep rubbing the crayon stain until all remaining marks go off. Dry the wall with a towel. The first thing you should do is to attack the stains with Mr. Clean Magic Eraser. Use the heavy duty version for textured walls. Spray the stain with hairspray if that failed to work. If the process appears to be working, repeat it. You may have to try this several times to get the required results. Be gentle while wiping to avoid ripping off the paints. Coat it with some plain toothpaste if any stain remains. For about 10 minutes before you wipe it clean. Add an adequate amount of detergent to form some bubbles when the water is vigorously shaken. Pour some of the water on the cloth and run on gently on the stained spot. Rinse the clothe well and repeat as often as necessary. If the stain persist, dry the stained area thoroughly using a towel before you move on to the next step. Rub the Mr. Clean Magic Eraser on the stain once the surface is dry. Before you begin, run a check for any sign of mold or mildew damage beneath the dry wall before you start. If the dry wall has large cracks in it or crumbles to your touch, consult a professional to know how you can proceed. Get ready for disinfection and cleaning by removing every decorative item or furniture from the stained area. Make sure you put on some protective rubber gloves, a mask, and goggles to keep yourself protected. Lay the plastic sheets on the floor, over the windows and vents and secure them with the tape. Mix 1 part detergent with 3 parts warm water in a spray bottle. Spray the mixture round the affected spot. Use a large rag to scrub the mold off. Get the second spray bottled filled with very clean water and spray it to wash the area. Use a rag or towel to wipe it dry. In the third spray bottle, make a solution of 2 parts water to 1 part bleach. Spray the affected area with the mixture. Allow it for about 10 minutes, then rinse with the water from the spray bottle. Use a clean towel, rag or cloth to dry. Discard all plastics and towels in a tightly bound garbage bag and throw it away with normal garbage. Flush away every liquid used for the washing down the toilet. One great tip that must not be overlooked when it comes to how to clean painted walls is to clean your walls as often as possible. Do not allow stains to stay for too long before you clean, if you do, the stain may become too hard to be cleaned off. 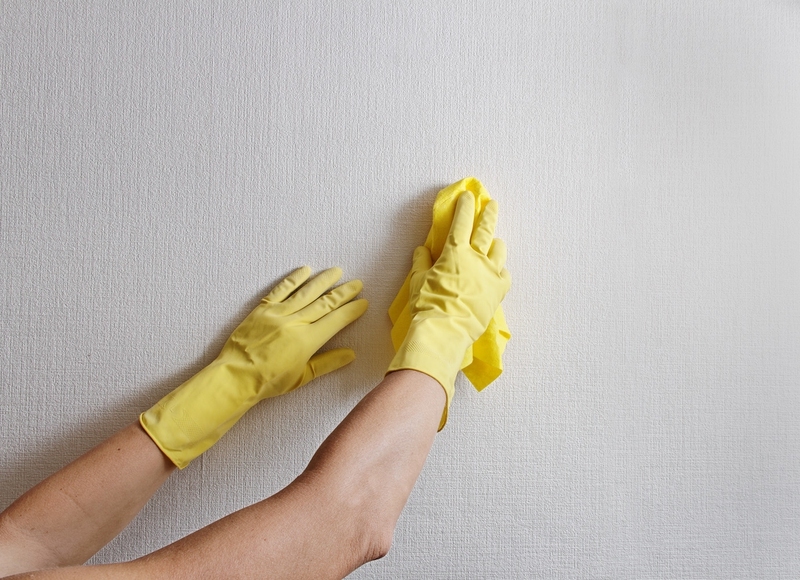 Cleaning your wall often will save you some repainting costs in the long run. According to paint makers and experts that have one or two things to tell home owners about how to clean painted walls, waiting about one week after painting before you clean your walls will ensure the paint has had enough time to dry. When using chemicals, make sure you are getting adequate supply of fresh air. Wearing protective clothes and gloves is also important.